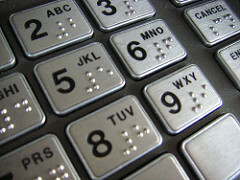 Some years ago, British bank Standard Chartered launched a handful of ATMs that were what they called “blind-friendly”. There weren’t too many of them. And they didn’t stay functional for very long. Now, after working on it for about two years, Singapore’s national bank has rolled out talking automated teller machines (ATMs) for the blind – DBS has recently announced it was voice enabling 86 of its 1,000-plus ATMs across the island. This is great for those with visual impairment and for elderly people with failing eyesight. Previously, those with problems with eyesight had to rely on walk-ins at the local branches or on Phone banking. Now, after some 1000 man hours of research, user experience research and testing, talking ATMs are here. There were some ATMS that offered tactile keyboards earlier, but these special ATMs offer audio guides and instructions on Braille. To get these ATMs working, customers need to plug their headphones into the standard 3.5 mm headphone jack – the screen goes blank for security reasons and then the voice instructions will begin. Right now, users can check their account balance and withdraw cash. Other standard features are not available for now. And even with Singapore being multilingual with four official languages, the ATMs function only in English right now. Based on how these ATMs will take off, there are plans to include more features and language options later. Talking ATMs are not new to banking with the world’s first such ATM being launched in 1997 in Ottawa – this after blind customers Chris and Marie Stark filed a discrimination complaint with the Canadian Human Rights Commission in 1991. Apparently this ATM cost a reported $500,000 Canadian dollars to manufacture. Countries like the USA, Australia, Philippines and China have followed suit. And our own State Bank of India has voice-enabled 7,000 out of its 18,500 ATMs across India, as there are as many as 10 million people who are visually challenged. This is a great example of how technology can revolutionize a business and the way people do business. We live in an age where the customer dictates what he wants. And is rather impatient when his needs or expectations are not met. We know that banks offer almost identical services, with hardly any difference in pricing. So what will make the cut are services that their customers deem worthy. Relationships that customers feel they need to be loyal to. And when Banks are proactive about being inclusive to all kinds of customers, it will take them a long way in increasing loyalty and brand value among its customers – or at least one segment of them.